Growing Swiss chard is my absolute all-time favorite (well, after compost, which not everyone considers a “crop”). Chard isn’t fussy about light - it tolerates the dappled afternoon shade under the edge of the apple tree. It doesn’t bolt when the weather gets hot, stands up under a bit of frost (when large), is stunningly beautiful, is relatively disease-free, and is one of the best-tasting and versatile greens there is. Swiss chard is a biennial, meaning that under normal conditions, it will grow the entire first season without going to seed. It’ll die back to the roots when it freezes in the fall, but as long as it doesn’t get below 15 degrees F, it will come back from the roots the second year, when it sends up a flower stalk, makes seeds and then dies. But here's a tidbit I learned the hard way about growing Swiss chard: if you start it from seed indoors, make sure you wait until all danger of frost has passed before planting it out. Why, if it's hardy to 15 degrees? 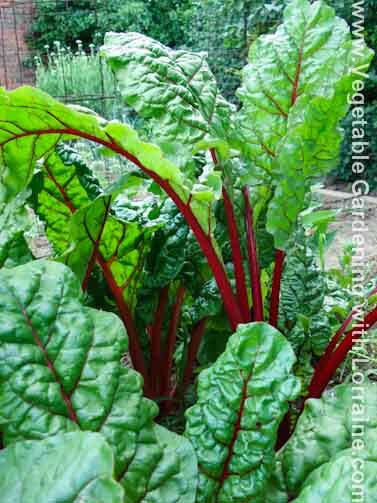 Chard is a tough plant and will easily survive a frost, but if it gets a frost when it's little, it gets confused and will “bolt”, going to seed as soon as it can. So be patient, and wait to transplant them out until there's absolutely no danger of frost. I used to think Swiss chard was developed from beets, but it's actually the other way around. According to one book on the cultural history of plants, chard has been cultivated as a food and medicinal plant since the 2nd century! It's also it referred to as silverbeet, perpetual spinach, spinach beet and leaf beet. One source says they started calling Swiss chard to differentiate it from French spinach, but is more well-known in Mediterranean cuisine than in Alpine dishes. Chard seeds are big and gnarly, but each of these "seeds" actually contains two or three individual seeds. Start Seeds: it’s best to direct seed 1-2 weeks after last frost, but can also be started indoors 3-4 weeks before last frost. Transplant: 1-2 weeks after last spring frost, when soil is at least 50 degrees F. If they catch frost when little, they will bolt. Nutrition: plenty of nitrogen. 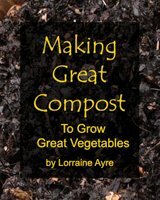 Best is well-rotted manure or high nitrogen compost. Harvest: two ways: take leaves from the outsides of the plant up to 4 or 5 at a time (recommended), or cut off the whole plant near the bottom and it will re-grow. When they all come up, snip of the smaller one(s), so that the biggest one won't have competition. Don't pull them up or you'll damage the roots of the remaining one. Plant seeds 1/2" deep and 8-12" apart, depending on whether you are planting in deeply worked, intensive or raised beds, or in traditional rows. As with lettuce, there are two main ways to harvest. The first is to take up to 4 leaves from the outsides of the plant, leaving the center leaves. You can harvest just what you need, leaving the rest to keep growing until the next time you want some. Chard "stores" better growing in the vegetable garden than it does the fridge! The second way to harvest chard is to cut the entire plant off a few inches above the base. The plant will regrow from the center of the crown. This has always seemed a bit cruel to me, in that you have taken away most of the plant’s ability to gather energy from the sun, and it has to pull stored energy from its roots to get going again. I prefer the first method, and my chard plants just keep producing and producing right up until they get a really hard frost.